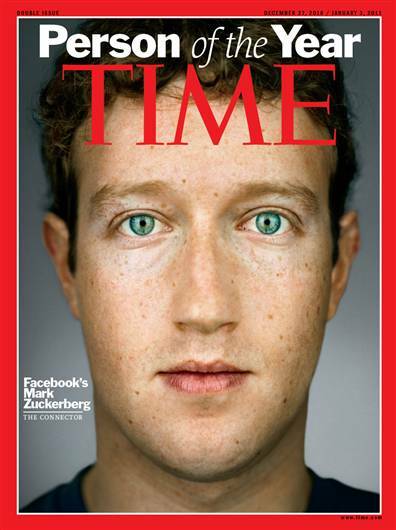 Facebook founder Mark Zuckerberg is TIME Magazine’s Person of the Year for 2010. He has become the second youngest person to become TIME’s Person of the Year. 26-years old Mark Zuckerberg is the youngest Billionaire in the publication’s history to get this honor, after Charles Lindbergh. Time editor Rick Stengel made the announcement on the NBC morning program – “More than half a billion people on the planet live in a world created by Mark Zuckerberg. The good news is, their friends all live there too. Zuckerberg founded the social networking site Facebook in his college dorm six years ago, but 2010 was the year that Facebook reached critical mass, both in sheer quantity of users and in its presence (through its ‘connect’ features) all over the Web.” He beat WikiLeak’s Julian Assange for the top spot.